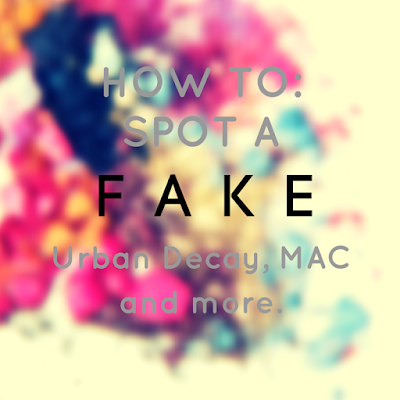 How to spot a FAKE! Urban Decay, MAC and more. Welcome back. Now I am sure a lot of you may have bought or have been bought makeup for Christmas. If you're as addicted as I am I'm sure it would have been on your wanted list this year. Unfortunately no matter whether you have been naughty or nice you can get caught out either way by the fakes on the market. Sadly, unless you REALLY know your stuff you could have no idea what you've bought. Now I am going to be a bit controversial here, I don't always think fakes are a bad thing. I know I know I shouldn't say it but hear me out. If you know you are buying a copy product and you have made the decision to go through with it then that to me is fine (kinda, I mean you are taking money away from the actual manufacturer. But I'm pretty sure they have enough money anyway). I know when I was younger and wanting to follow the Zoella's of the time I used to get really miffed that all the items they used were out of my budget so I would have kind of loved a fake palette, so in that sense I don't mind. If it looks too good to be true it probably is!! I know this sounds super negative but let's be frank, if you are looking for a palette that costs £38.99 in Debenhams and you happen to come across one on ebay for £9.50 it has either 'fallen' off the back of a truck or it's fake. I mean there's luck and then there's just a trap. Always look at feedback and reviews and check the stock. Ebay will always say how many are available and how many have sold. It is totally possible you've come across someone who bought it by accident or it was a doubled gift so is selling it on cheap but they would most likely only have one of the product and wouldn't have sold one before. So let's say you've bought one and you get it, so is it a fake? It's hard to tell when you have nothing to compare it to. First and foremost it shouldn't be light, these companies take pride in the quality of their products and weight goes along with that. Secondly, look at the font. Fakes never have a perfect font, there may be parts disjointed, it may be too wide, give it a rub, is it staying on? 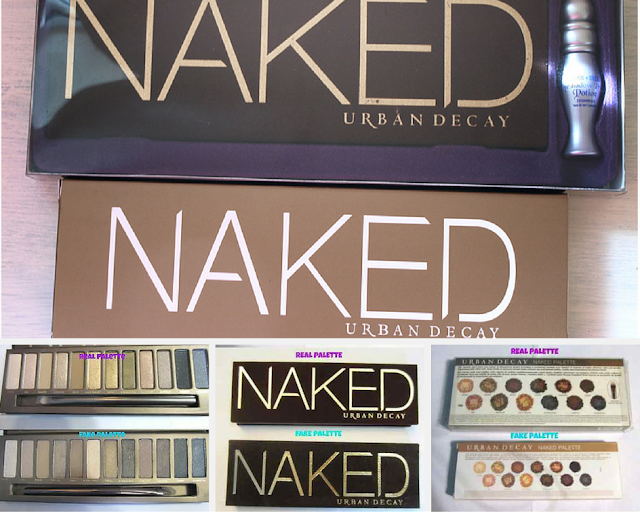 Google the product and find a picture of the packaging, you can then look and compare for discrepancies. Now what? Well your best bet is to initially get back in touch with the seller to see if you can get your money back. Sometimes they're good to you, sometimes they're really not. If you are having trouble get in contact with Ebay immediately, they take the selling of counterfeit goods very seriously and you should be able to get it resolved asap. 1. Use Paypal to check out, you get far more protection when it comes to a dispute. 2. Take note of the sellers name in case they disappear. 3. Take the product into a shop to compare to the real thing if you are unsure. 4. Keep calm when dealing with the sellers, they're trying to make a living and most people don't respond to anger. 5. Don't blame yourself, this has happened to me before and so many others. It's not your fault. Finally I just want to say it's not just Ebay that has this problem. I've seen it happen on Gumtree, Shpock, Depop, Preloved any reseller website really so be vigilant. Hopefully I have posted this early enough for you to take action if you have been caught out in the Christmas period.